This article needs images! If you have any images of the things detailed in this page, please add them to this page. This page needs some images! This page is about tactics and methods. 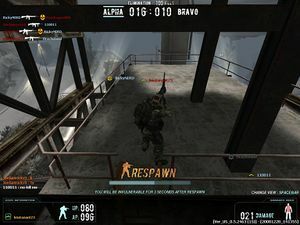 For the general guide on how to play Combat Arms, see Getting Started. Combat Arms is a very straightforward game. Any enemy that sees you will shoot you. There are several playing styles and tactics that will maximize your kills and minimize your deaths. Performance in game can be influenced by many factors. This includes guns, armor, reflexes, good aiming, sharpness of eye, and many others. Another factor is lag. People with better connections will find themselves not lagging as much as some other people and thus getting more kills and fewer deaths. The playing styles and tactics also varies greatly with the game mode, map used, and arms settings. The sections in this page will explain miscellaneous tactics that apply to all maps. The following pages provide map-specific tips. In Combat Arms, standing in the same place for too long is not a good idea. Moving targets are harder to aim for, while a stationary target is the easiest thing to hit. Also, if the Kill Cam is on, you should always move to another place after scoring a kill, because the Kill Cam reveals to your victim where you are. Even if the Kill Cam is not on, people will still eventually catch on to your location. Being mobile not only includes moving forwards, but it also includes moving sideways and jumping. In fact, enemies will have the hardest time aiming at you if you continuously jump from side to side. While doing this makes it harder for you to aim, it makes it much harder for your enemy to aim, and you'll likely win fights against a non-jumper. Both heavy and light vests change mobility and armor. The heavy vest siphons 10% mobility penalty, but grants 15% extra armor. The light vest on the other hand, takes 10% armor but gives 10% speed. This may come to your advantage in future firefights. There are also other speed-boosters, such as the Black Beret and the Bandana which grant a small mobility percentage at no penalty. Camping is another tactic which will be explained below. Note that camping is not exactly the same as standing in the same place. Camping is to your advantage when carried out correctly, and campers still have to move from spot to spot. When you play Combat Arms, there is no mercy. Anyone that can kill you, will kill you, so you need to be alert and slightly paranoid. While in-game, never go AFK (away from keyboard) in an open area. If you must, try and hide in a secluded spawn area. You don't have 360° vision. Enemies will often be behind you, so a good habit is to swing around and look in every direction once in a while. People that don't watch their backs die more easily. Besides checking your back, always check corners and any small nooks and crannies that a person could be hiding behind. Sound is an important aspect of the game. You cannot play Combat Arms without sound. It will tip you off if someone is shooting you, or whenever any shooting is done for that matter. Even when someone is approaching you, you can hear their footsteps. Because the finer sounds are difficult to hear if they come out of your computer or monitor, it is highly recommended that you use headphones while playing Combat Arms. Walking normally is standard most of the time, but it might not get you to where you want to be fast enough. To get anywhere faster, hold Shift while moving. Also, you may switch to your knife or pistol to run a lot faster, but be sure to switch back to your gun before going into battle. Your sprint points, or SP, will decrease, and when you have no more SP, then you will not be able to sprint. While sprinting, you move around twice as fast, but your footsteps also make more noise and you are unable to shoot. If the situation requires you to be more stealthy, then remember to walk by holding C. Walking will cause you to move almost twice as slow, however, it eliminates the sound of your footsteps. Also, your crosshair will become smaller for ease of aiming. Lastly, you can hold Ctrl to crouch. Crouching turns your entire body into a smaller target, and also increases the accuracy of your shots. You can still move around while crouching, but you will move at the pace of a snail. Sometimes, crouching can completely hide you from view in situations where standing up would still reveal your head. Learning when and how to use these three alternate movements when appropriate can help a lot in Combat Arms. Shooting an enemy will deal different amounts of damage depending on where you shoot. A headshot will always be an instant kill, unless the person is wearing some sort of head protection (helmets, masks). While aiming for the head is a good, it is not always practical. In that case, always aim for the chest. The arms and legs are smaller than the chest area and harder to aim for anyways, so arm and leg shots are almost always by accident. For some reason only a shot to the upper arm, not the forearm, causes damage. True to the realistic nature, you won't do any damage by shooting somebody's backpack or gun. Keep in mind that most high-damaging weapons usually have slow firerates. Use this tip to select weapons. For example, the L96A1 is the slowest firing weapon in the market, yet is the one of the two weapons that will kill in one shot. The UMP, compared to the UZI, has a slow firing rate but higher damage. For some guns, especially Shotguns, the damage will decrease with distance. An M590 Military Shotgun will 1-hit kill at a close range, but it may take up to six or more at a farther range. Prior knowledge of these types of things can help you to deal the most damage. There are two basic movement styles: Rushing and Camping. Neither one is better than the other, and they each have their advantages and disadvantages depending on the scenario. Most people make use of an intermediate combination of both rushing and camping. Rushing is when you run around the map and go to your enemies. Rushers use the environment and surroundings to their advantage. For example, running along a wall will make you less likely to be noticed than if you run straight down the middle of the open. If you are forced to run across an open area, you may want to throw a smoke grenade to hide your movement. Rushers also jump around a lot to avoid being hit. There are no "rushing spots" as there are camping spots, because rushers will make use of the entire map. However, if you rush, you should avoid staying in the enemy's spawn points for too long. This is because spawners are granted a three-second invincibility, and that is quite enough time for them to kill you. This tower camper in Snow Valley has been revealed by the Kill Cam. Camping is basically when instead of going to your enemies, you stay somewhere and wait for enemies to come to you. The popular camping spots are around common areas, because more people will come to you. By camping in an unpopulated area, you don't die many times, but you don't get lots of kills either. For example, if you camp in a corner, every time someone runs past, you'll see them, but they probably won't see you. Then, you can pop out of the corner very suddenly and kill the person. Spawn camping is a type of camping where you camp near an enemy spawn, but not on it. When enemies spawn, they will not see you, and when three seconds are up (count to three slowly in your head, or wait for the spawner to stop flashing), you pop out and shoot. Note that camping on the spawn is useless because you will be seen during your enemy's invincibility. If you camp in the same spot too long, people will realize where you are camping and go to get you. Especially if the Kill Cam is on, you want to go to another camping spot after camp-killing maybe two or three people. The usefulness of camping and number of good camping spots available depends on the map used. Though when Kill Cam is on, a good tactic is to move to another camping spot where you have a clear view of your previous camping spot. The enemy you killed before will go there and you have another opportunity to kill them. Towers are a bad place to camp, because snipers will look there first. There are several ways to fire a gun. Holding down until you are forced to reload isn't always the best thing to do, while sometimes it is. There are four firing styles: Spraying, Bursting, Tap Firing, and Sniping. People will most likely use a combination of these in their games. A few guns come with changeable firing modes that help facilitate a firing style. Learn the way to fire that is best suited for your gun and situation. These firing styles only apply to primary weapons (assault rifles, submachine guns, machine guns, and sniper rifles). Spraying is basically getting in your opponent's face and holding down the left mouse button to unleash the entire mag of bullets in their general direction. You keep spraying until the person is dead. Spraying is associated with auto-fire weapons that have either a high rate of fire, easily controlled recoil, a huge mag or belt, or a combination of these. Because spraying doesn't require precise aiming, it would be wise to jump around a lot to avoid being killed by the person that you are trying to kill. Whenever using a spray gun, always reload whenever you have the chance, because when you spray, your ammo will go down quickly. If you have to reload before your enemy is dead, you are most likely going to be killed. A tip is to hide behind a wall or two boxes stacked on top of each other when reloading. Sniping is the opposite of spraying. Rather than using the entire clip in your enemy's general direction, you aim your shot carefully to ensure that it hits. Sniper rifles are extremely accurate guns that come with a massive-magnification scope so that you can hit people that are very far away. However, sniping can be done at medium range also with any accurate gun. The K2 and M14 Assault Rifles have a single-shot mode that will largely reduce the recoil and increase the accuracy of the gun, facilitating sniping. Bursting is a intermediate between spraying and sniping. You basically spray a string of around two to six bullets, stop to let the crosshair and recoil settle, and then fire another string of two to six. Doing this can help negate the bad thing about Assault Rifles: the crosshair gets absolutely huge after spraying a while. Some guns like the M16A3, AUG-A1, SCAR-L, AK-103, and others have a burst-fire mode that will fire off three bullets whenever you click your left mouse button once. The crosshair will then return very quickly. You can still burst with an automatic gun, simply by letting go of your mouse button and clicking again. Tap Firing is a combination of bursting and sniping. This firing style uses a faster fire rate than sniping, slower than spraying, yet more accurate. Tap Firing is tapping very fast, yet not fast enough to let the recoil get out of hand. You want to center the aiming reticle (works best with a scope) on the body and tap as fast as you can without the recoil causing your aim to go off the target. This works very well with a G36E, as the scope has increased magnification for farther shots. You can also do this with any Assault Rifle with a scope. This does not work well for SMGs, however, because the recoil on an SMG does not have a straight up pattern for the first few shots (generally speaking), thus harder to control recoil. Junk Flea: Search and Destroy, Spy Hunt. Two Towers: Search and Destroy. Pump Jack: Search and Destroy, Spy Hunt, Quarantine. Brushwood: One Man Army, Capture the Flag, Search and Destroy, Spy Hunt, Quarantine. Cold Seed: Search and Destroy, Spy Hunt, Quarantine. Waverider: Search and Destroy, Quarantine. Rattlesnake: Spy Hunt, Capture the Flag, Quarantine. Death Room: Search and Destroy, Spy Hunt, One Man Army, Quarantine. Showdown: Search and Destroy, Spy Hunt, Capture the Flag. Overdose: Search and Destroy, Spy Hunt, Capture the Flag. Gravedigger: Search and Destroy, Spy Hunt, Quarantine. Road Kill: Search and Destroy, One man Army, Spy Hunt, Quarantine. Cabin Fever: One of four maps you can play Fireteam on. Desert Thunder: Another map you can play Fireteam on. Oil Rig: Latest map on Combat Arms. This page was last edited on 4 December 2012, at 01:17. This page has been accessed 41,079 times.